TAREND Dehydration systems operate at low energy levels and reduce labor costs significantly. Growing demand for dried fruits and vegetables is increasing the need of using efficient dyring systems. TAREND with its 30+ years experience is providing economic, hygienic and efficient solutions. TAREND Dehydration systems allow its users to dry almost all kinds of fruits, vegetables and herbs such as apples, apricots, grapes, tomatoes, carrots, onions, persley and many others. 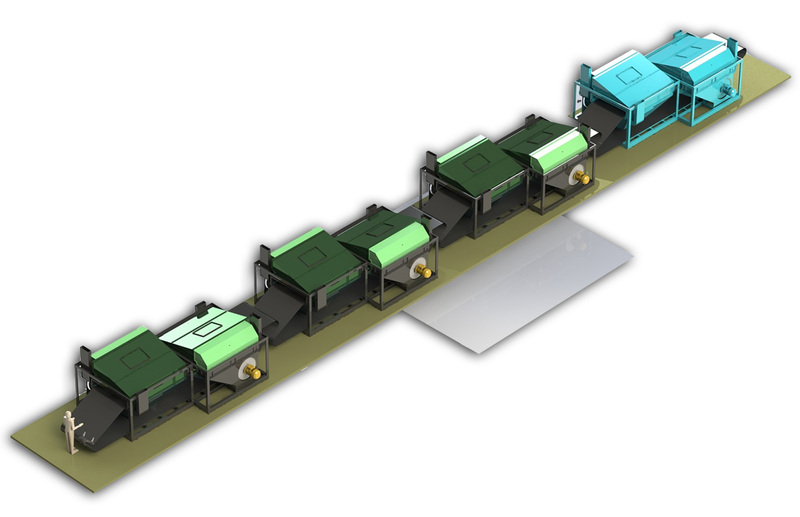 TAREND Dehydration systems are continuous, multistage and belt type dryers. Products are carried on a perforated stainless steel belt and dried with heated forced air. This unique system prevents aflatoxin and bacteria existence which allows users to dry products in hygienic conditions. TAREND Dehydration systems are designed and manufactured based on below parameters. TAREND Dehydration Systems can be provided with single, double or triple drying stages. Each stage is composed of modular 2.5 meters long drying units. Number of drying units in each stage is set according to the desired output capacity (kg/hour). A single drying unit has 120.000 kcal/hour energy capacity. Since the system is composed of modular drying units, it is possible to add up to 10 drying units to a single stage to increase the capacity. Stages are connected to each other with a connection belt. Products pass through outside atmosphere on connection belt which improves drying quality and throughput times. Perforated stainless steel belt is used in TAREND Dehydration systems. Belt is supported by chains at both ends and by wheels in the middle. Wheel support allows the belt to carry heavy loads. Perforated structure of the belt helps the air to ventilate through the products and improves overall drying. Automatic cleaning system which is placed on the return strand of the belt allows easy cleaning of the system. Desired dried product capacity can be chosen from the capacity lists at which you will find almost all kinds of fruits and vegetables. All materials with direct contact to products are made of stainless steel to ensure hygiene of the system. We propose 3 options to our customers for the body of the drying units; stainless steel, galvanized steel and painted steel. While stainless steel body has the longest product life, painted steel body is the most cost effective solution. Each drying unit has a temperature sensor which allows to control the air temperature at each drying unit and it enables to achieve optimum time/temperature curves with each product. TAREND Deyhdration Systems can work with almost all kinds of energy sources such as LPG, diesel, coal, geothermal and many more. To minimize heat loss and fuel consumption, drying units are isolated with polyurethane sanwich panels. To enable the easy maintenance, a cleaning door is available on the panel of each drying unit. High temperature of the final products need a certain period of time for cooling before final packing process. Cooling unit at the end of the system speeds up cooling process and increase overall efficiency.